Solar Records Archives - Page 2 of 9 - Solar Love! 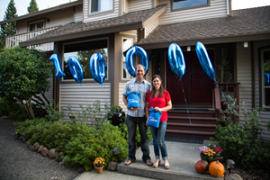 America’s largest dedicated residential solar company, Sunrun, announced Tuesday that it had surpassed 100,000 home solar customers. Founded in 2007, Sunrun has made it a priority to make going solar a simple proposition for its customers, making rooftop solar customizable with their lifestyle and savings goal. Subsequently, with 100,000 customers now under its belt, Sunrun has helped customers — who together have generated more than 1.3 terawatts of clean electricity — save more than $100 million on electricity bills. The lucky 100,000th customer was Ken and Lindsey Noren of Santa Rosa, California (pictured). With third quarter financial earnings just around the corner it will be interesting to see whether Sunrun has managed to keep its strong growth from the second quarter as it has obviously continued to expand its customer base. In its second quarterly earnings report for 2015, Sunrun revealed that it had finished the second quarter with approximately 87,000 customers. New figures from China’s National Energy Administration have proclaimed that the country installed 9.9 GW of new solar PV capacity in the first nine months of 2015. According to the National Energy Administration (NEA), by way of the country’s state media outlet, the Xinhua News Agency, China installed a total of 9.9 GW of new solar PV capacity in the first nine months of 2015, including 8.32 GW from solar PV power stations and 1.58 GW from distributed PV projects. The news comes not long after the NEA announced earlier this month that China’s solar PV capacity is set to reach 150 GW by 2020. According to Dong Xiufen, the director of the new energy office with National Energy Administration, “future work will focus on distributing PV in central and east China as well as PV stations in west China” in an attempt to increase PV capacity by 20 GW each year. The NEA revealed earlier this year that China had installed 7.7 GW of new solar PV capacity in the first half of the year, bringing the country’s total capacity up to 35.8 GW. Fast forward through the third quarter of 2015, and another 2.2 GW of solar capacity was added, bringing the country’s total cumulative capacity up to 37.95, broken down into 31.70 GW from PV power plants and 6.25 GW from distributed PV projects. This puts China well behind its own finish line, however, after announcing in March its intention to install 17.8 GW of new solar PV capacity in 2015. Furthermore, as reported, the NEA was forced to allow 9% of total installed solar PV to sit idle for the first six months of the year, a figure that has apparently increased by a percentage point or two since June. China’s official press agency has revealed that the country’s solar PV capacity is expected to hit 150 GW by 2020. According to Xinhua News Agency, quoting Dong Xiufen, the director of the new energy office with National Energy Administration (NEA), China’s solar PV power capacity will hit 150 GW by 2020. Dong Xiufen referenced the latest NEA data which had the country’s total solar PV power capacity standing at 35.8 GW at the end of June, and that “future work will focus on distributing PV in central and east China as well as PV stations in west China” in an attempt to increase PV capacity by 20 GW each year. The NEA released figures earlier this year showing that China installed 7.7 GW of new solar in the first half of the year, admitting that congestion on the grid caused by a higher share of solar energy forced 9% of total installed solar PV to sit idle for the first six months of the year. This allows for a huge second half of the year, if analyst predictions are to be reached. 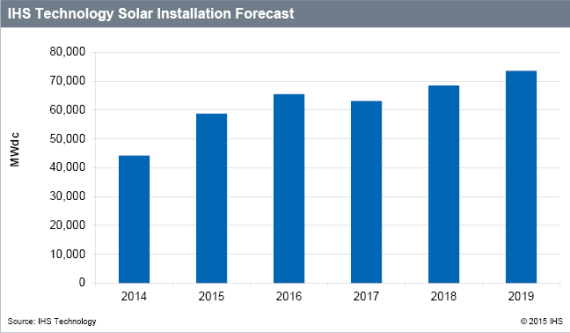 IHS senior research director Ash Sharma believes that China is likely to install in excess of 17 GW in 2015, contributing heavily to a global solar PV demand demand of 59 GW. Interestingly, China’s own predictions come in under the predictions of some analyst firms, such as cleantech advisory firm Apricum, which in August predicted China’s total cumulative solar capacity to reach 180 GW. The Berlin-based cleantech consulting firm predicted that 92 GW of solar will be added annually by 2020, with 36 GW coming from the combined forces of China, the US, and India.